Open house - discussion on the larger intent driving hillhacks and the immediate direction for it. Address Durgatop - #3467, Top floor, Durga Nilaya, 2nd cross, 13th main, Indiranagar, Bangalore. *Directions Get on 100 ft road indranagar. At 13th main cross(Land mark: Methodist Church), take a right (if you are coming from the Koramanagala side). You are now on 13th main road, heading in the general direction of Jeevanbhima Nagar. Take the second right. Landmark: Time PreSchool. Then take first right. Come to the end of the road. Durgatop is terrace floor of the last building on your left. Context: Trying to partner with Adidas Uprising for the skateboarding and arts connection at hackbeach. Get together of former and future hillhackers, and anyone interested in our fork off event, hackbeach. 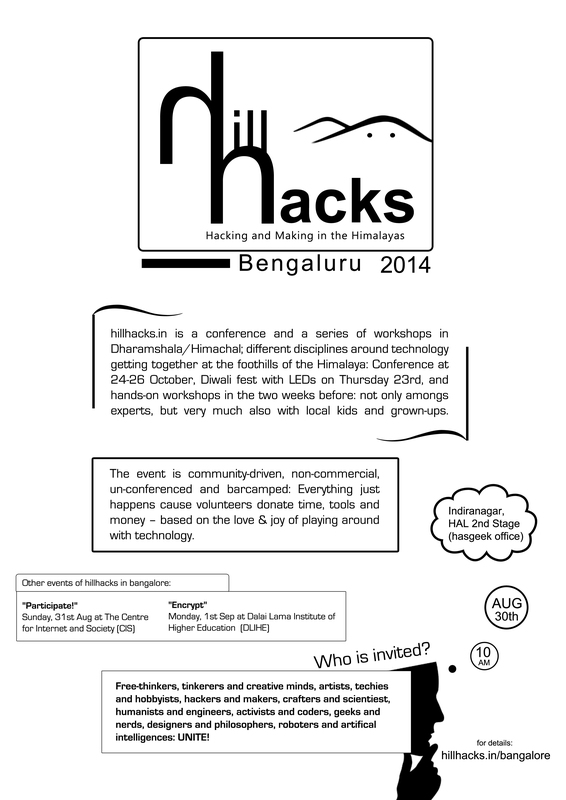 Special guest: anyone who has been at hillhacks before and is in BLR now. * Thanks to [[https://www.nilenso.com|nilenso.com]] for their lovely support! General get together of former and future hillhackers, and anyone interested but not able to come over to the mountains this year. Special guest: someone who was at hillhacks the first days and is in BLR now. Indiranagar, HAL 2nd Stage: #2699, 19th Main, 5th Cross. Thanks to hasgeek.com for lovely support! Please come by and throw bricks and bouqets. A great opportunity to know what's happening and to get on board with this project! On Friday, 14th October, 7 p.m, at hasgeek.in office in Domlur / Indranagar. It is helpful to know how many ppl we will be to arrange some food etc. Maybe also add the topics you are interested in, ideally we directly form some subgroups that start working out some of the topics. aruna - interested in knowing which teams she can be part of. Also to meet everyone again! your name? - your interest? Will be leaving at noon, to go to Jaaga Penthouse, Richmond Road, where people are going to be around till a little after 3 for the unicycle meetup(www.fireflyunicycle.com, http://fpaste.org/150860/59860591/). Everyone's leaving to go to Freeman's Farm after that. People will be around at Freeman's farm on Saturday night and all of Sunday. A bunch(sva, debanjum, yuvi, others(?)) will leave from there for Kerala. Indiranagar, HAL 2nd Stage: #2699, 19th Main, 5th Cross. Thanks to hasgeek.com for lovely support! Short presentations and demos of projects around technology and making, and it's impact on our world and society (and what we can do about it). These so-called lightning talks should be around 5mins, but in no way longer then 10min. Afterwards we can exchange with some beer and music! You know people that could tell some interesting stuff? Let them know! If too many, we can decide “bar-camp-like” on site what we want to hear. Most times ppl also get inspired on site itself to tell something! The Centre for Internet and Society, No. 194, Second 'C' Cross, Domlur, 2nd Stage. Thanks to CIS-india for wonderful support! Planning and organizing session for hillhacks. Everyone who wants to be involved in whatever way, has any input and ideas for us is very invited to join in! There will be cake and tea, and if we feel like we can watch some talks/presentations of other conferences in the evening. There were plenty of people from various organisations. Thanks so much for your interest and contributions! Dalai Lama Institute for Higher Education. Thanks to DLIHE for giving us the great opportunity to serve! Introduction I: Who are we? Introduction II: What is the Centre for Internet and Society (CIS)? Introduction III: What is hillhacks? Break: lets talk to each other on what we have learned! Workshop: get your hands-on your devices! Bring your Smartphones and Laptops - and if you don't have any, bring a USB pen drive! Learn how to protect your online communication and activities on a daily base! Have a cryptoparty all together! Get to know the very basics of encryption, and directly learn how to use them. sva first gives an introduction on basic concepts of cryptography. She will e.g. explain how public-key-encryption works, which can be used for email encryption, and also directly tell what software needs to be installed and configured to directly use it. Another topic will be secure webbrowsing via Tor: Again the concept behind it will be introduced as well as the actual way to use it. Very important is also short-messaging (like whats-app etc) and use of protecting methods on mobile phones. In the second part the students can directly try out what they have learned. Speakers are sva (hillhacks) and beli (CIS). This event will be for the students of Dalai Lama Institute of Higher Education. If you want to attend, too, please contact us! * and hands-on workshops in the two weeks before: not only amongs experts, but very much also with local kids and grown-ups. The event is community-driven, non-commmercial, unconferenced and barcamped: Everything just happens cause volunteers are doing it – based on the love and joy of playing around with technology. People donate time, tools and money to make something new happen: Different disciplines around technology getting together at the foothills of the Himalaya.